Can a flatbed scanner scan comparable detail to a drum scanner? Does a flatbed scanner have the dynamic range comparable to a drum scanner? While ultimately good drum scans will win over flatbed scanners, this page shows the the difference is decreasing. 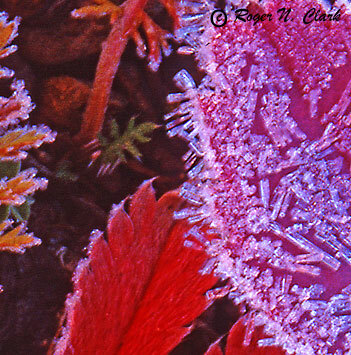 Figure 1 shows the test image taken with a view camera on 4 x 5 inch Fujichrome Velvia film. Figure 2 shows a comparison of a small area in the center of the image obtained on an HP7400 flatbed scanner in 2002. Figure 3 shows results using an Epson 4990 scanner in May, 2005. The Epson scans were done with 16-bits per channel. 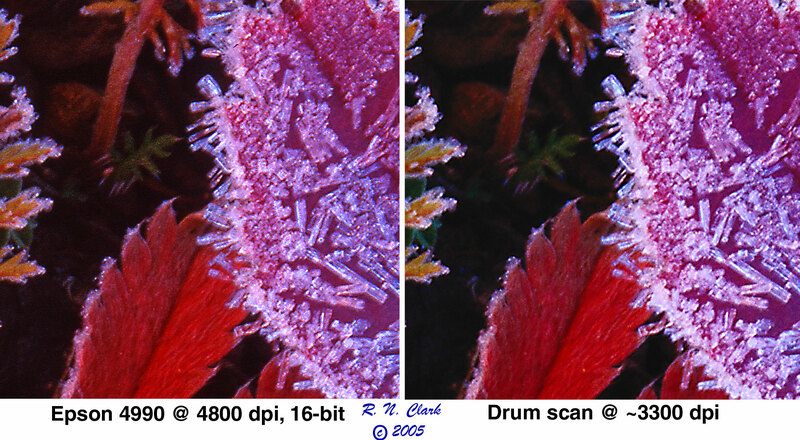 The Epson 4990 scans are considerably sharper than the HP7400 scans, and comparable to those of the drum scan. The drum scanner was a Linotype-Hell, Heidelberg Tango scanner capable of 11,000 dpi and film sizes up to 17.7 x 18.8 inches in a vertically mounted drum ( click here for more drum scanner info). Figure 2. The comparison between a 2400 dpi scan on a HP7400C scanner and a drum scan at 3300 dpi shows the flat bed does pretty good. Figure 3. The comparison between a 4800 dpi scan on an Epson 4990 scanner and a drum scan at 3300 dpi shows the Epson records similar detail as the drum scan. Figure 4. The Epson scan from Figure 3 with shadows increased to illustrate the shadow detail recorded by the Epson 4990 16-bits/channel scan. 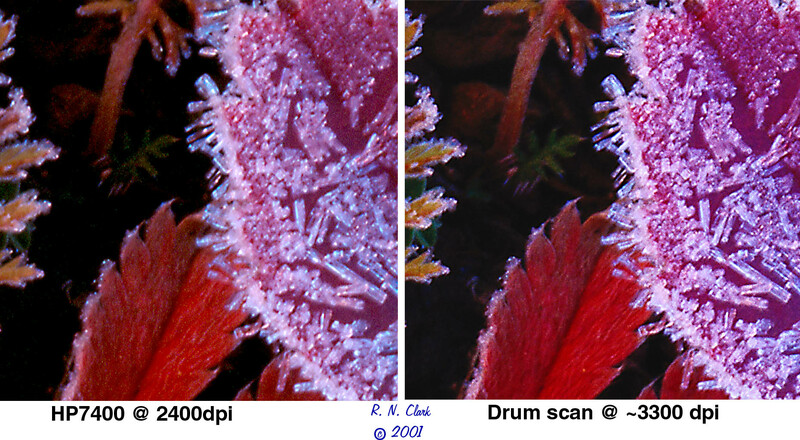 The Epson 4990 scanner does quite well compared to the drum scan. The 16-bits per channel gives plenty of dynamic range to pull details out of the shadows (e.g. Figure 4), and bring out highlights in bright areas like clouds (e.g. 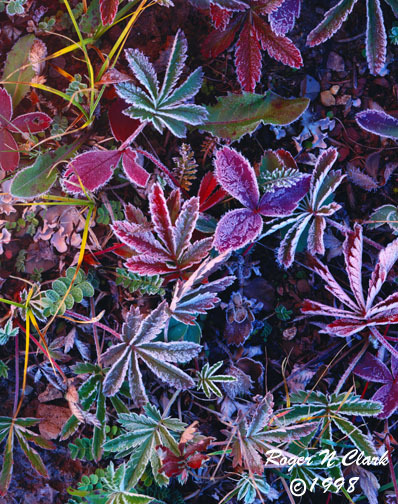 see the the Fall Colors Gallery looking for 3200 dpi 16-bit/channel scans). The 4990 scans a 4x5 transparency at 3200 dpi, 16-bits/channel in about 5 minutes. In tests of observed signal-to-noise ratio in a 16-bit file, noise ~ 130 and signal ~65000 for a dynamic range of 65000/130 = 500, for a Dmax of 2.7. Figure 5 shows the edge response of the Epson 4990. Figure 5. The Epson 4990 edge response as a function of pixels per inch. While the response is a little low at 4800 ppi, the 50% response occurs near 2600 ppi, and still above 40% at 3200 ppi. Important to achieving high resolution from a flatbed scanner is confirming your film is at the focal plane of the scanner. I did this by placing a razor blade on the scanner glass, shimmed up on one end. A scan of the edge showed parts of the blade in focus and the ends out of focus. By examining the focus as a function of distance with some simple algebra, I was able to compute the height above the glass of best focus. My Epson scanner is focused at the film plane within my measurement error. The sharp focus region is approximately 0.04 inches. This means that any 4x5 film scanned must not sag beyond that limit or focus may be poor. Last updated October 28, 2005.